The Washington Post has a review this morning of a book that contains all the laws passed by the first session of the first congress. Now given that the tax code runs to 60,000 pages, and the Obamacare monstrosity runs to 2,000 pages, you might expect a monster book. It comes in at 93 pages. An interesting set of statistics in the review is the salaries paid top officials. So my contention, and that of other people as well, is that the proper way to pay people is in gold. Historically, i.e., prior to Roosevelt Ⅱ, the dollar converted to gold at the rate of $20 per ounce of gold. So the table shows the salaries of President, Vice President, Chief Justice, and Associate Justice in terms of 1789 salaries, the gold equivalent, and the value of that gold at today's (11/03/2013) market price. Congresscritters got paid a per diem of $6 while Congress was in session, for a maximum possible of $2,190. Actual salary was probably far lower. It appears that, as bad as our politicians are, we're getting a bargain. Panasonic Home Theater System for $500. Insignia 50″ Plasma HDTV for $700. Apple 8GB iPod Touch for $175. Sony 3D Blu-ray Disc Player for $219. Sony 300-CD Changer for $209. Garmin Portable GPS for $139. Sony 14.1-Megapixel Digital Camera for $200. Dell Inspiron Laptop Computer for $450. TiVo High-Definition Digital Video Recorder for $300. * I haven't checked all of these, but most are no longer available as of today (11/4/2014). There have been similar drops even since the 1980s. Back in 1985 my wife gave me a computer memory board for my Apple II+. The board came with 256KBytes of RAM. You could buy additional RAM to take it up to a whopping 1MByte, for a total cost of about $400. You can now buy a 1GByte chip for about $40. That’s a thousand times more for a tenth of the price, or increased purchasing power of 10,000x. A 60MByte hard drive 1988 set me back about $1,000. I now have a 1TByte drive that I paid a little over $100 for. ￼We recently disposed of a 5 year old HDTV that died. It cost $3,000 back in 2005. 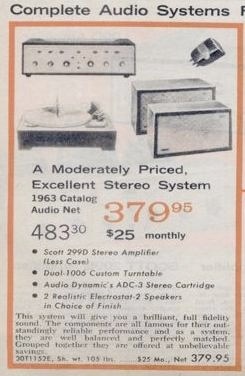 To repair would be $700, and to replace would cost the same, so the expensive tube went to the dump. I’ve blogged about the cost of education, and about how it’s outpaced inflation. I cited as examples the cost of my tuition at GW in 1964, and the cost given by Camille Paglia for her tuition at another school at the same time. This site gives the cost of tuition at Harvard from 1900 till the early 2000s. The standard BLS tables show an increase 20x in the CPI since 1913. If you consider not the BLS figures, but the price of gold ($20 per troy ounce) in the period prior to the New Deal, and the current price, you get a factor of 60x. Tuition at Harvard was $150 in the period 1900-15. That’s about $3,000 according to the BLS, $9,000 in gold equivalence. Actual current tuition is about $33,000. That’s an increase of 220x. The chart below shows the cost of tuition at Harvard from 1900 to 2009. It took from 1900 to 1928 for tuition to reach $400. It stayed there until 1947, after the GI Bill had been in effect for 2 years. It doubled to $800 in 1953. Between 1957 and 1962, the years of the National Defense Education Act, it went up 50%, from $1,000 to $1,520. In the period since then tuition has risen 20x. ￼Inflation in housing, education, agricultural, and probably medical care, has outpaced the overall inflation rate. While market forces and creativity have created deflation in sectors such as consumer electronics, other sectors have pulled overall prices up creating a period of inflation. 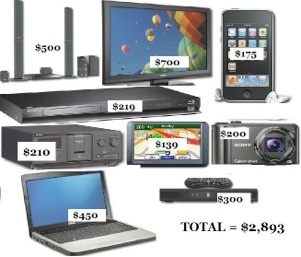 What do all of these inflated sectors have in common that the consumer electronics sector doesn’t? They are all affected and afflicted by government interference, whether in the form of regulation, and closed shops (public education), or by subsidies, such as housing, education, agriculture, and medical care. The introduction of these programs has driven costs up in the affected sectors, and has hurt everyone for years. Get rid of the government meddling in those sectors, and you may well see a gradual, and sustainable deflation in overall costs, and an increase in the health and well being of the citizenry. The folks over at Big Government have posted this graphic that shows the projected unemployment rate without the stimulus package (the middle line), the projected rate with the stimulus (the bottom line), and the actual rates, in red. 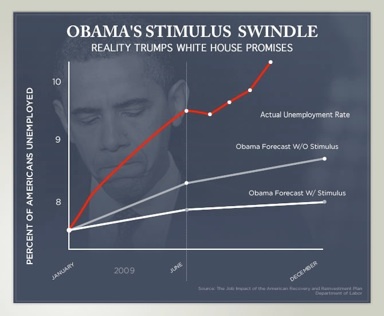 Obama’s crew said that the stimulus, which is spending and taxation, would create jobs. I argued that what was needed was getting rid of whole agencies, cutting taxes, and letting people have the money they earned. So who was right? The bright guys from the Ivy league who ran Wall Street, and are now running the Fed and the Treasury, or the retired technical writer, and libertarian crackpot? The chart over there on the left shows the relative sizes of UPS, which is lobbying for the reclassification of FedEx, and FedEx. 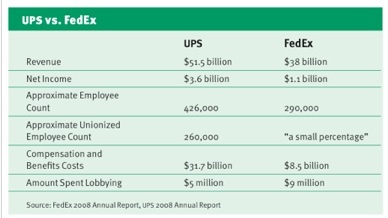 Were FedEx to have the same proportion of workers as UPS unionized (61%) the employee costs for those unionized employees (158,700 rounded), assuming the same level of wages and benefits ($74,413) be $11.8 billion. In other words the costs for the unionized segment would be about 130% the cost of the entire workforce, both union and non-union, that it is currently. Perhaps the time has come to get the unions, which represent 7% of the workforce, out of politics. *Note for those not familiar with Milton: Ezra Pound commented that Milton was choc-a-bloc with Latin, and so did violence to English. English relies on position for subject-verb-object assignment, while Latin and Anglo-Saxon (Old English) rely on conjugation and declension. We tend to read Him as the subject, but Him, as shown by the -m is objective case. The line should read Who disobeys Him disobeys me, but the rhythm and style are flat without the misplaced objects of Him and me. Drop in number of workers at the bottom of the employment ladder supporting older workers at the top as they enter retirement. This has been bad for Social Security. 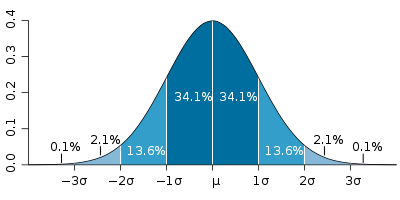 We know that intelligence follows a distribution curve similar to, but not identical to, the curve shown here. We therefore know that we have lost a predictable number of gifted people to the vacuum aspirator. We also know that we have lost a number of ordinary workers, teachers, and other decent citizens, as well as assorted unborn miscreants. All of these can be reasonably predicted based on statistical probability. As a consequence we have lost any contribution these children might have made. We have also lost genetic variations that might have contributed to biological evolution. We’ve lost both the added demand that would have been created by the never born as they grew into adulthood, and the product, or supply that they would have created as they moved into the workforce. It’s pointed out that some of the most creative and productive societies are those that have high population densities. Does this suggest anything? It might mean that high population density means not only more people to communicate with, but also greater speed of communication. The tightly packed network is capable of faster interactions, and therefore more interactions. The tightly packed society operates in Teraflops while the less tightly packed ones operate in Megaflops. Other than the mantra about a woman’s right to control her body, which is somewhat problematic in that anyone’s right to control of their body is limited by someone else’s right to control of their body, and the baby in the womb, despite idiot feminist assertions to the contrary, is a body, and not a piece of tissue, I can think of no way in which the right to abortion is derivable from first principles. But this has been elevated to what Mark Shea called the sacrament of abortion, and its proponents brook no deviation. On a policy level there are reasons to be against abortion, not only because it is immoral, but also because it threatens us biologically, economically, and technologically. That’s just for starters. The rest of the gang are just as incompetent, just as racist, and just as power hungry as Pelosi, Byrd, and Clinton. Leave it alone. Even if it’s true, the next guy is much worse. Glenn Reynolds over at Instapundit notes that the cash for clunkers program may be suspended. I’m retired, as is the Jurassic wife, so we’re nursing our cars along, and haven’t been paying too much attention to this Obamascam, but apparently cars were supposed to be turned in, and then rendered completely unusable. Rather like old battleships they were supposed to be turned into razor blades. So cars that could have been broken up for parts, or that could have provided transportation for the poorer members of society, are broken up, recycled into something other than cars, and a market is extinguished. If the O team really cared about poor people, why not let everyone have more cash in their pockets, rather than robbing the rich, and hurting the poor at the same time. Update: CNBC is reporting that the program is getting an additional $2 billion. It figures, The O crowd and the Dems run not on the votes of the poor and disadvantaged, but on the fatcats who support environmental causes, and want to be seen as doing good, even as they hurt the deluded saps who gave them power. On Fox news this morning there was some discussion about the fact that the O couple haven’t chosen a church yet. Now for most people who are in a denomination it’s pretty simple. You go to the Catholic, Episcopal, Lutheran, Methodist, or other church, synagogue, or mosque that is closest to you. The O couple are saying that they don’t want to disturb others. Of course, as they pointed out on the news, the big Os don’t have any problem with disturbing people in NYC when they want to go on a date, or go to a hamburger joint. If he’s really interested in his religion, and doesn’t want to disturb people, he is commander in chief, and he could get a chaplain in from one of the services, or even appoint a chaplain for the White House. The priest who is the religion correspondent for Fox made the point that the O couple were setting a bad example for their children. Their actions say that inconveniencing people at a hamburger joint is okay, but that religion is so unimportant that not attending church is okay. As for the idea that it’s possible to be spiritual without being religious, that idea was promptly dismissed. To the extent that this spirituality without religion has any validity, I would think that it is merely the first stage on a longer spiritual journey, something that I discuss in the post on Bonaventure. The fact of the matter is that the O couple have no religion. He chose Jeremiah Wright’s church because, 1) most black Americans are nominally Christian, and 2) its bigotry and anti-white, anti-American stance both mirrors and feeds the resentment of black Americans. In Chicago this enabled him to get elected. When his stage widened he had to attack his opponents in other ways. So a complaisant press dug up dirt on his opponent John Ryan. A carpetbagging Alan Keys was unable to compete, and Barry was on his way to the Senate. When he started running for president Wright became an embarassment, and so Barry, who believes solely in himself, dumped him. He dumped him because he could no longer be elected solely by minority voters who were clustered in a community. In order to broaden his appeal, he dumped Wright. It’s not the first time a pol has trimmed with the demographics. Doug Wilder when in the VA legislature opposed the death penalty, because his constituents did. When he ran for state office, and had to appeal to voters from across the state, he suddenly found that the death penalty was okay. Barry’s just trimming his sails, trying to find the best church to suit his electoral needs. It’s been 36 years since Roe v. Wade. In that time 1 to 1.5 million Americans per year have died without making an appearance on the world stage. Now suppose that they hadn’t been killed. Some of the youngest of them would now be working in MacDonald’s, Burger King, and Taco Bell, and others would be doing the jobs that American’s won’t do because we’ve killed off the population that would otherwise be doing it. We’d have over 50 million people adding to consumer demand, and maybe 30 or 40 million doing productive labor. We’d have additional artists, mathematicians, doctors, lawyers, and scientists pushing us further ahead. We’d also have more criminals and ne’erdowells, but the good effects would equal or surpass the bad. Glenn Beck and some congresscritter (Michelle Bachmann, R-MN) were going on about the census last night. According to them the proposed census questions constitute an invasion of privacy, and we should answer just the question about population. The constitution mandates that an Enumeration shall be made within three Years after the first Meeting of the Congress of the United States, and within every subsequent Term of ten Years, in such Manner as they shall by Law direct. Now manner could refer solely to how the census is to be done, but it could refer to questions asked as well. According to this site there was controversy about census questions even in 1790. Some of the questions, such as race, are not specifically mentioned in the section pertaining to the census, but were implied by other sections, such as enumerating the free and slave populations. The race question has been asked since 1790. The question in the 2010 census is sillly. (Is there really an Hawaiian race? Once you get beyond 4 or 5 don’t you really start talking about nationality or ethnicity? Does race have any real meaning?) Many of the invasive questions are used to apportion funds from various government programs. A congresscritter, who votes on legislation, and presumably reads this stuff with more understanding than those of us who merely suffer under it, should know this. If Beck and selected congresscritters want to complain about the questions on the census, they should complain about the programs that require them. Anything else is just demagoguery. I’ll leave it to any interested readers to go through the rest of the Factbook, pull out the figures, and do the math. Feel free to send me the results if you do. Today’s Washington Post has an article on declining museum visits. It seems that teachers are taking fewer trips to art galleries and museums. The number of 8th graders reporting such trips dropped from 22 percent to 16. The NEA is also reporting fewer visits by adults to galleries or visual arts festivals. Now it may be that reports from 8th graders are not reliable, or it may be that visits are in decline. On the other hand, it may be that the number of blockbuster exhibitions has declined. The National Gallery of Art, for example had its Pompeii exhibit, which has now travelled to LA, but has no major shows scheduled for this year or next. It could also be that many times the exhibitions are insulting to the audience. A few years ago, I went to the Corcoran biennial, and some Hispanic artist had done a series of paintings featuring mutilated gringos. Why would I want to go patronize a gallery that even indirectly is advocating my death? Maybe some of the decline is justified. Original Date—May 24, 2009<br> I think we’ve all heard the claim that much of the DNA in humans and other beasties is junk. Now what I wrote about in my academic life is not evolution as such, but the reaction of writers and philosophers to the idea of evolution, so I know more on the literary/philosophical side than I do on biological/geological side. That being said, however, I’ve tended to think that junk DNA might not be so junky. Now comes a study from Princeton that contends that this DNA is not so junky after all. A study of Oxytricha concludes that it plays a role in rearranging the genome. See the article here. I was playing around with Wolfram Alpha the other day. It can give you the current population of the US, but it doesn’t give historical census data. So I Googled the 1860 census. Page xv of the Introduction to the census mentions that manumissions of slaves had increased in a number of states, including Alabama and Georgia. It also mentions the topic of Indian slavery. It seems that some tribes owned a number of slaves. Had the rebellion not happened, would the trend have continued, and the slaves been freed without the bloodshed? From the Statistical Abstract. Of formerly married males from 15-44 over 48% had 15 or more partners. Formerly married females in the same age group maxed out at 38% with 3-6 partners. Only 19% had 15 or more. So women are less inclined to be promiscuous, but promiscuity is still linked with divorce. Pro-life people have been pointing out that Planned Parenthood targets Black people. Their clinics tend to be in Black neighborhoods. Interestingly enough, according to this table from the Statistical Abstracts, the rate per thousand for white women went from 21.5 in 1990 to an estimated 13.8 in 2004, and the rate per thousand for Black women went from 63.9 in 1990 to an estimated 49.7 in 2004. The number of abortions dropped during the same time period from 1.6 million to 1.222 million. Black women during this time period were more likely to abort than white women, possibly due to targeting by Planned Parenthood and other abortion providers, but by 2004 the rate and number of abortions had shown a significant decline. Newt Gingrich on his conversion to Catholicism. Bookmark this page for periodic updates.